I learned that he was an early proponent of using EMS in combination with his weight lifting regimens. He discovered a unique way to use this technology to enhance muscle tone and definition. It seemed like a strange idea to me at the time, but I have always been fascinated by technology that can be used to enhance performance. EMS is actually a fairly simple technology. Electrical impulses generated by an EMS unit are delivered through electrodes, which are to be applied directly over the muscle group you desire to recruit. These impulses are similar to the action potential (nerve impulses) generated by our central nervous system. Our muscles respond to this impulse through contraction. EMS is not a tool for weight loss, nor is it a total substitute for weight training or exersize. What is EMS best for? Electrical stimulation is frequently used for re-training muscles that are having trouble contracting. It is commonly used for people who have had a stroke or an orthopedic surgery. Many times these patients have trouble trying to move a muscle or joint. When the electrical impulse is sent into into the muscle tissue, the muscle can contract without the help of the patient. If the patient can actively engage the muscle while it is being stimulated, the brain can relearn to stimulate the muscle on its own. There are two theories as to how EMS can relieve pain. The Gate Control Theory says that pain signals are sent to the brain via nerves but must pass through a “gate.” The stimulation sensation from EMS is said to pass through the gate, thus blocking the nerves that deliver pain sensations. Another theory is that the muscle stimulation causes the brain to release the body’s natural painkillers (endorphins and enkephalins) resulting in pain relief. In bodybuilding or athletic training, EMS can be used to enhance recovery, increase muscle tone, definition, and sensory-motor reaction time. Electrical muscle stimulation can also provide greater muscle contraction as compared to a normal voluntary contraction, by up to 30%. I have recently been self-experimenting with EMS for these purposes. My favorite device is called the RX-8000 manufactured by StimRX. I really like the RX-8000 because its very effective, simple and easy to use. When I got this device, I literally took it out of the case, removed the electrodes, placed them on my quadriceps, plugged it in and turned it on. The instructions weren’t even necessary to get started. It includes with everything you need for EMS training and TENS pain relief (reusable electrode pads, abdominal stimulator, power adaptor and batteries). 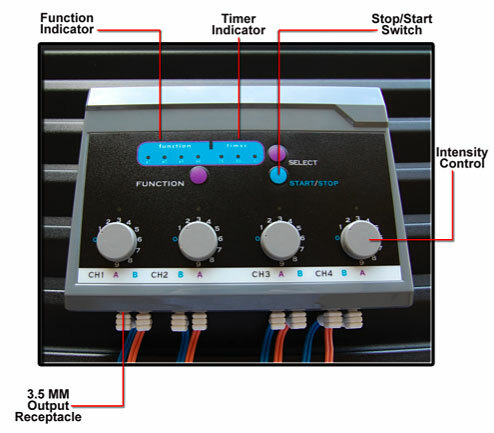 The RX-8000 uses a Russian Stim Frequency. Russian Stimulation is a specific form of electro-stimulation with a Symmetrical Biphasic Square waveform produced by dividing a 2500 Hz carrier frequency into 50 Hz packets . Originally developed by the Russian Olympic team for muscle mass enhancement, is now often used for muscle strengthening, muscle spasms & Edema reduction in the United States. Russian Muscle stimulation is similar to EMS. It is designed to stimulate motor nerves. However, the high frequency of 2500 Hz allows for deeper muscle penetration and a more complete/stronger contraction of the muscle fibers. If you’re interested in this technology, I highly recommend this EMS device. It is safe, effective, user friendly, and I find it very useful in my strength conditioning and physical therapy routines.